As you think, and whether can Mick change the mind and continue musical activity as simply red ? In 1977 I was managed by Roger Eagle, who ran Eric's in Liverpool. He was completely hopeless as a manager but he did have an extraordinary record collection, and that's how I first heard dub music. I thought I was pretty cool, listening to all this obscure Jamaican music, until I went to a club in Moss Side and discovered that dub was for white boys - Jamaicans were into lovers' reggae like the Mighty Diamonds. You can hear dub in Simply Red songs like 'Moving Picturebook'. I try not to wear my influences on my sleeve, but I might have failed by having huge dreadlocks for much of the Nineties. Here is a song by the greatest R'n'B vocalist of all time, who never got his dues in this country. Again, Roger Eagle turned me on to all the great old records on the Duke label and this was one of them. Bobby Bland has been screwed over the years, like so many of the original R'n'B singers who ended up piss-poor and frustrated after getting into bad contracts. I'm hoping to do an album in tribute to him - my musicians have been going over the songs and I flew over from Milan to see him when he supported Van Morrison - and if I can make this happen I'll make sure he gets something from it. [Founder of Fleetwood Mac] Peter Green was a strange fascination for me as a child. I loved 'Albatross' because it had an unusual melancholy, but it sounded nothing like the music they were making when they started. Then I discovered that Green left, gave all his money away and had something of a breakdown, and this song sounds like he's on the edge of everything all going wrong. It also sounds very British, and in that way Fleetwood Mac had the edge on the Rolling Stones, who initially sounded like an American blues covers band. Fleetwood Mac had their own identity from the start. This is the one white guy who's been a huge influence on my vocals because of his range and vibrato. It's sad that it didn't work out for Tim, but his albums did sell well in the Seventies whereas now, when if your first album isn't huge you're out on your ear, he wouldn't get anywhere. Can you imagine him going on X Factor? I wonder what Slimy Coward would have to say about someone with as much spark and attitude as this. Slimy has done a massive disservice to real artistic creativity. There's no space for people like Dylan, Lennon and the Stones in Slimy's world. I met him in an elevator once. You expect him to be small - he's not a tall guy - but he has the most enormous head. Prince has the same thing, and short guys with big heads do seem to make good pop stars. Everyone thinks I'm short, but I'm not. Anyway, I heard a recording of a Little Richard studio session from 1955 in which the band are playing straight New Orleans blues at a walking pace. Little Richard gets bored and tells them to speed it up and there you have it: the birth of rock'n'roll. I love Little Richard's hysteria, and his insanity ... and his big head. 1. The words for the chorus to 'Fairground', one of Simply Red's biggest hits, are from its co-writer Toby Roebuck's novella The Furrowed Brow. 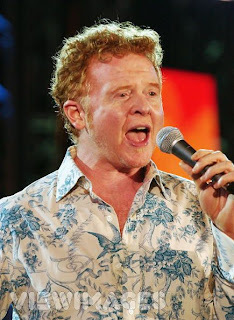 Roebuck later fell out with Hucknall, drawing attention to the singer's fear of haddock. 2. Hucknall has a reputation as a ladies' man. Catherine Zeta-Jones, Martine McCutcheon, Helena Christensen and glamour model Kathy Lloyd are all reputed to have been 'Hucknalled'. 3. 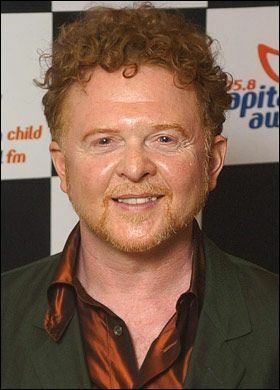 Hucknall made his public debut at the age of four, singing 'I Want to Hold Your Hand' to relatives. 4. In 1998 Hucknall got into a fight with Liam Gallagher after he said Oasis embarrassed Mancunians. 5. The red wine that Hucknall's Italian vineyard produces is called Il Cantate (The Singer). It is our most important sites!!! Urgently come!